Is it possible or not to make a staircase independently? Despite all the apparent complexity, the main advantage is that the attic stairs with their hands can be performed with all the features inherent in each particular house. Attic stairs are necessary for convenient lifting from the house to the attic. 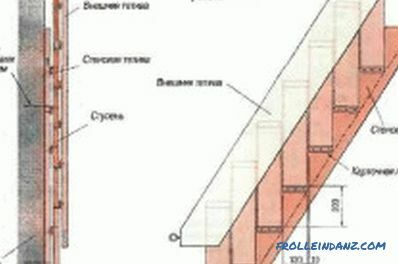 Types of attic stairs: stationary, sliding, folding. 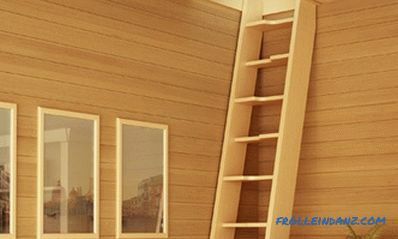 It is most rational to use a stationary type of ladder construction in cases when the attic is equipped for residential premises or where frequently used auxiliary premises for household purposes are located. Here you can distinguish marching type of stairs and screw. 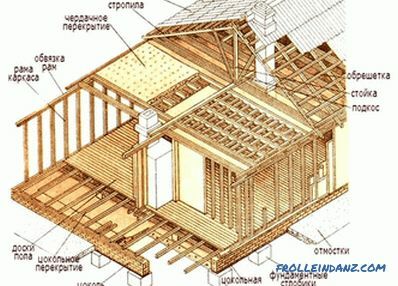 For making it yourself, especially if the experience of carpentry and carpentry work is not very large, a combination of floors with a solid structure consisting of one march or several is better suited. Mobile (side) ladders or stepladders should not be considered as an option for permanent use. The risk of falling in this case and getting injured is large enough. Their use can be justified only at the construction stage or as a temporary option during repairs. With a lack of space for a stationary device or for rare use, folding-type ladders have proven themselves very well. Their main advantages are compactness, simplicity of the device and reliable operation. 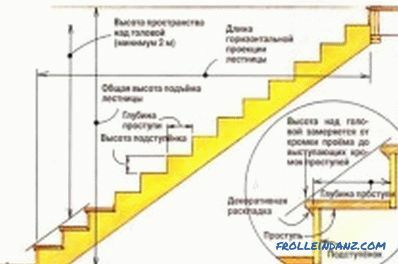 The main requirement for stairs is the safety of their operation, which consists of the structural features and the strength characteristics of the material. Required dimensions for the design. The important point is the ratio of the angle of inclination and the occupied area. The larger the angle, the larger the footprint. On the angle of inclination will depend on ease of use. 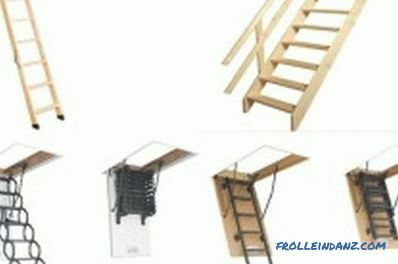 The generally accepted for ease of use attic folding ladder is the angle of 60-70 °. For frequent use in a stationary version, it is preferable to use an angle of 45 °. 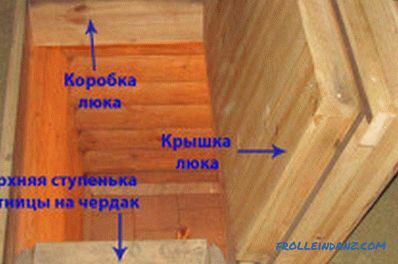 Dimensions of steps in height are 15-20 cm, in depth - about 25-30 cm. The minimum width of the flight of stairs should be chosen so that an adult can freely use it, approximately 65-70 cm. For the manufacture of stairs with their own hands the most convenient material to use is wood. Pine is most commonly used, due to its easy accessibility, good workability and performance, and, importantly, its relatively low cost. a set of bits for tightening fasteners. 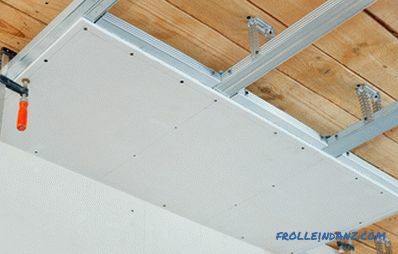 The simplest in independent production is a one-way fixed attic ladder. For its construction, you need two planks of sufficient length to obtain the required angle of inclination. The thickness of the boards is preferably 50-60 mm. Scheme of a one-way staircase to the attic. Steps can be made from boards of the same thickness or slightly less. With a bowstring. The steps are mounted either in the grooves specially selected by the router in the array of the side board, or on additionally installed on the inside of the bars (fillies) or metal squares. With the aid of kosour. In the array of side boards, horizontal platforms are selected on which the boards of steps are installed. The final fastening of the steps to the bowstring or kosour is carried out using self-tapping screws. Additional fixation of the support of the steps between themselves can be carried out with the help of metal screw pins. With the help of self-tapping screws, the steps are fastened into place, and the ladder is fixed in the chosen place. It should be taken into account that in the case of a cold attic, heat loss with an open interfloor opening will be very high. 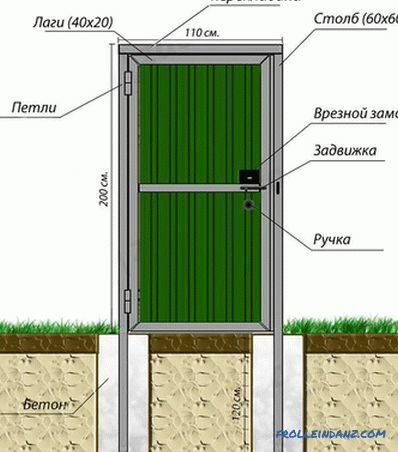 Therefore, it will be necessary to install a manhole cover or create a kind of vestibule. For increased operational safety, it is recommended to install a railing. 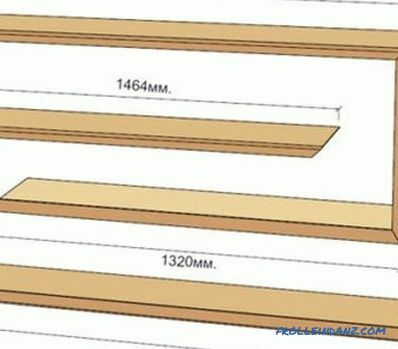 With a fixed installation option, this is quite simple.A planed, sanded timber of the required length, which is installed from floor to ceiling parallel to the edge of the stairs, is chosen as the railing. To enhance the strength of the structure, the rail bar is rigidly connected by vertical bars of a smaller section with steps. The railing, depending on the width and mounting option of the ladder, can be installed on one or both of its sides. Folding the attic stairs with your own hands will help save space and reduce heat loss due to the constantly closed hatch. Very well suited in cases where the attic is rarely used. Making the simplest construction is easy and takes a little time. A one-stroke staircase is being made. The total length should not be more than 30-40 cm higher than the height of the ceiling. Structurally, the fastening of the steps can be carried out both on the string and on the kosour. A wooden bar of sufficient cross-section is rigidly mounted under the hatch to the wall or ceiling with the help of anchors to ensure reliable fastening. The ladder is sawn across in a ratio of approximately 1: 3. The resulting parts of the stairs are connected with the help of loops. The upper part of the structure is also attached to the previously installed bar with hinges. The important point is the correct installation of the hinges so that when folded, the lower fragment with the weight of the whole structure is pressed against the wall. For additional fixation in the folded state, an additional fastening on the wall with a metal hook or rope loop can be provided. The main disadvantage that limits the use of this model is the need to place it near the wall. Also in the folded state sections with steps will remain visible, which does not always fit into the interior. A design variant of a wooden folding staircase to the attic. 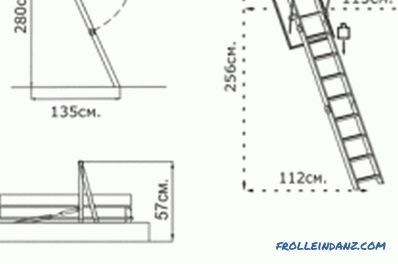 The design of a folding attic staircase, installed on the interfloor hatch cover, saves usable space and significantly reduces the amount of heat loss. As in the above cases, the material is selected for bowstrings and steps. In the array of bowstrings, grooves are selected where the steps to glue are placed. The final fastening in the grooves is done with screws. The finally assembled ladder is neatly cut into three parts, which are then joined using store-bought or self-made metal loops. The fastening of the loops is carried out in such a way that the connected fragments can be folded according to the principle of an accordion. The size of the manhole cover is chosen equal to or slightly larger than the size of the upper part of the stairs. During the operation of the ladder, its upper segment transfers the load to the open manhole cover. To enhance the construction and fixation in the open position, additional lever hinges are attached to the hatch. Schematic of the hatch box for the attic stairs. 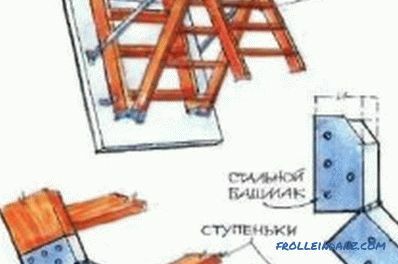 The process of opening and closing the stairs is carried out using a spring mechanism, the principle of operation of which is similar to the principle of operation of the folding mechanism of a sofa-book. To open the door, pull the cord down. The spring mechanism thus smoothly opens, the attic cover is lowered - and you can expand the stairs. the spring mechanism is activated and the hatch is finally closed. By adjusting the spring tension force, you can adjust the smoothness of the opening-closing and the pressure of the cover. An important nuance that should not be overlooked is the insulation and vapor barrier of the hatch cover. 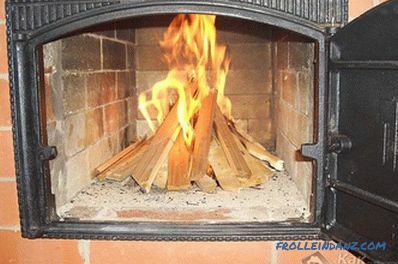 This is especially important in the case of a cold unheated attic. 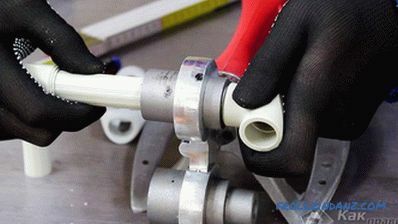 After completing the installation process and fitting the fittings, the whole structure is disassembled and its parts are subjected to decorative processing. The steps and the bowstring of the ladder should be covered with a wear-resistant coating in 2-3 layers. The hatch cover is trimmed by analogy with the ceiling trimming, although sometimes a contrasting trim accentuates attention. If the metal fittings are homemade, then it should also be covered with a layer of protective paintwork. If all the assembly operations have been done with due care, then the resulting ladder will rightfully compete with the purchased counterparts.